For many years now I have suffered with digestive issues that have been quite frankly a bit of a mystery. Every now and then I do some reading up when things catch my eye with things I haven't tried. When reading Sarah Wilsons blog (founder of 'I Quit Sugar' movement), I was fascinated with the claims that she made about bone broth. It's not the first time I've heard of it having digestive benefits, but it could my attention. Not only does she explain the benefits of the broth on your GI system but also on your joints. I have had done recurrent pain in my left knee for a few weeks now that I can't seem to shift. 7. It's great for nails, hair and women generally. Worst case I've made something from scratch that is delicious and healthy. So I started to assemble my ingredients. I turned on the slow cooker and added the above plus some vinegar (1/2 a cup - essential to have the acid component) and some fresh thyme. Most recipes just use the bones. If using meatier bones (e.g. beef) they are roasted first. 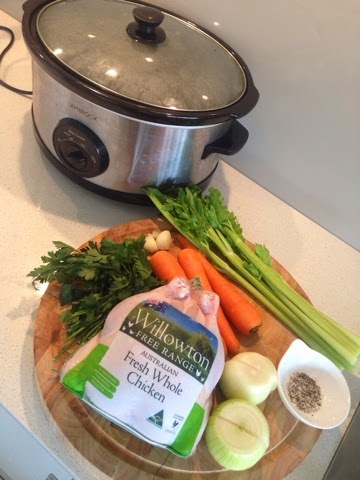 However, my aim in using the whole free range chicken, was to firstly slow poach it for a few hours and then remove the meat to use in a meal later on in the week. Afterwards, I will then leave the bones in the broth and let it continue to do its job until I go to bed or maybe even the next day. 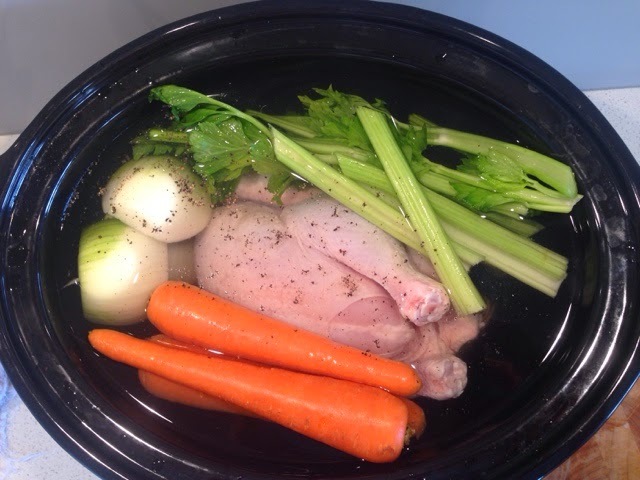 Have any of you been regular fans of a bone broth? I think I am going to make a batch of this a week and see how adding it to my diet regularly helps me.